The 4 star Hastings Stormont Hotel Belfast is located just minutes away from Belfast City Centre, adjacent to Stormont Castle and overlooking the beautiful grounds of the Stormont Estate making it an ideal base for business or leisure.Well known for it's business facilities and services, the Stormont Hotel offers 16 flexible conference and banqueting suites, including the Confex Meeting and Exhibition Centre. The largest function room, the Stormont Suite is suitable for Team Building and Team Development, Conferences, Exhibitions, Seminars, Gala Dinners and many other Evening Entertainment events. Located on the outskirts of Belfast City there is always lots to do and see whilst staying at the Stormont Hotel. Please see below a list of events taking place in the hotel. Situated in the leafy suburbs of Belfast, overlooking the landscaped gardens of Stormont Parliament Buildings and Estate. 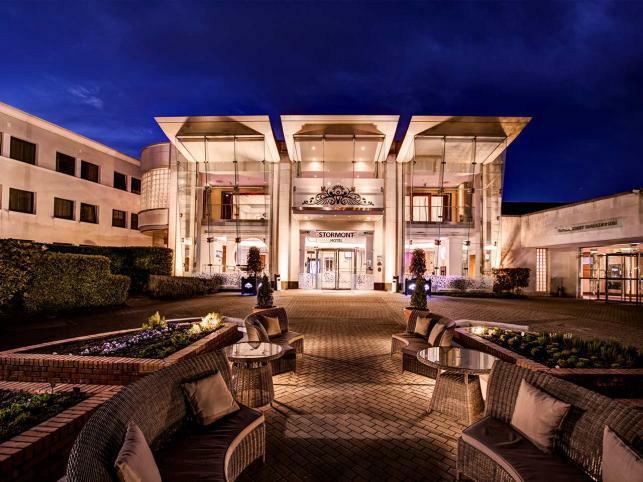 The Stormont Hotel is only 3 miles from Belfast City Centre. 3 miles from the Belfast City Airport, 40 minutes from Belfast International Airport, 15 minutes from the Belfast Port and Belfast Central Railway Station. In addition to an excellent reputation for professionalism and exceptional hospitality, this luxurious Hotel boasts superb facilities including complimentary car parking to assure the ultimate in comfort and style and the friendly and professional staff will ensure you have everything you need and much more during your stay.